This tempeh is sweet. salty, spicy and sour. Very moreish. 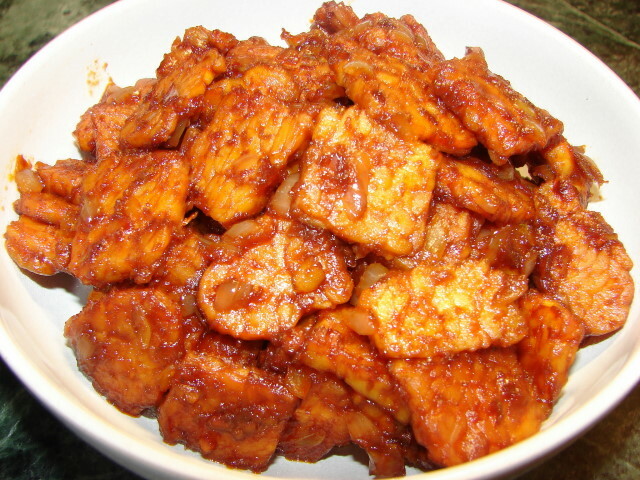 The recipe is based on Indonesian tempe kering (dry tempeh) with my own twist. I used Korean chilli paste which has a sweeter more mellow flavour. I don't have any lime leaf so I sub with lime zest. Cut tempeh into small pieces, stir fry with 4 -5 tbsp oil till golden brown. Remove. Add a bit more oil to wok and stir fry onion and garlic till softened. Add gochujang, soy sauce, enough tamarind juice to your taste, some sugar and lime leaves or lime zest. Stir till sauce is hot. Add fried tempeh, stir till sauce is absorbed. I love tempeh and this is the 1st time its in a non-halal dish!